Are global temperatures cooler in 2017 than 2007? An inconvenient truth: Global temps were warmer when Al Gore won the 2007 Nobel Prize than today, even after the 2015/16 super El Nino. Are Global temps cooler today than in 2007? tl;dr- This claim is false and has been retracted. The figure shown in the claim is wrong because it used one data interpretation method before 2010 and then switched to another after that, causing a false trend. As explained in @DikranMarsupial's answer, the source of this claim has retracted it as mistaken. The website that hosted the original plot has removed it from their page, though they appear to still have other graphs with the same mistake. 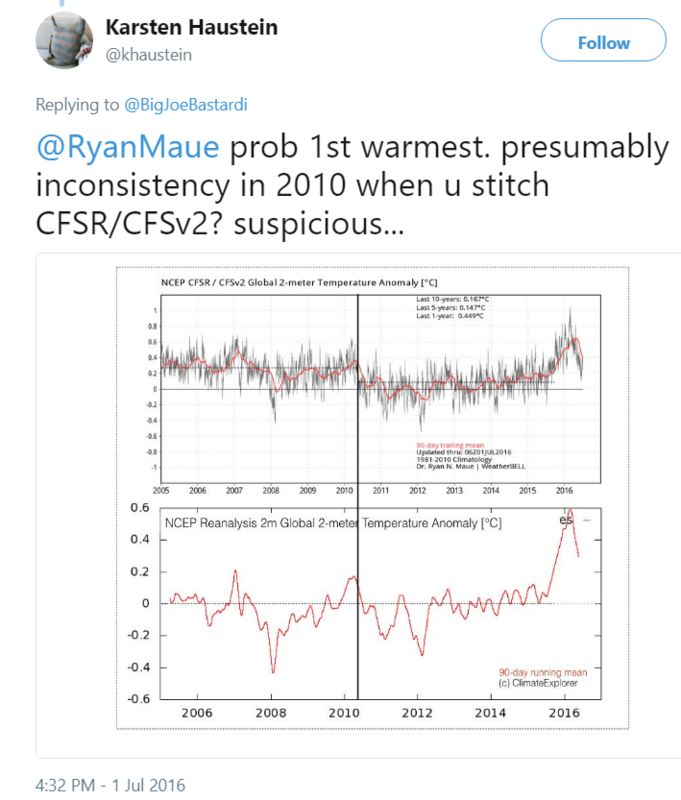 "Climate Science Denial Group GWPF Admits It Used False Temperature Graph" (2017-08-14) explains their take on these events. As they tell it, the original plot produced by Ryan Maue was factually incorrect, leading the GWPF to retract their claim based on that plot. The above tweet shows both the incorrect plot that this claim was based on and a corrected version of it. @DavidHammen's answer has more technical information and perspective on the topic. Original tl;dr- This is a partial answer because the data analysis here will require additional research. The data in the plot is heavily reinterpreted (it's not raw data), and literature on the topic discusses how this reinterpretation is highly subjective. So, is the data reflective of the climate change issue like the claim implies? I suspect not, but establishing why it's not would require further investigation. I'd note that the source of this claim is blatantly political and seems to misrepresent a lot of information related to climate change (in addition to a strange obsession with Al Gore). As such, I think that it's a reasonable assumption that that's probably what's happening here as well. However a more complete answer would find exactly what the definition and significance of the plotted data. It looks like the original plot came from "Weather Bell Models", however it was edited to include the "Gore wins nobel prize" and "Temps now" labels. Unfortunately, the source website is difficult to read through and to search. The CFS version 2 was developed at the Environmental Modeling Center at NCEP. It is a fully coupled model representing the interaction between the Earth's atmosphere, oceans, land and seaice. It became operational at NCEP in March 2011. 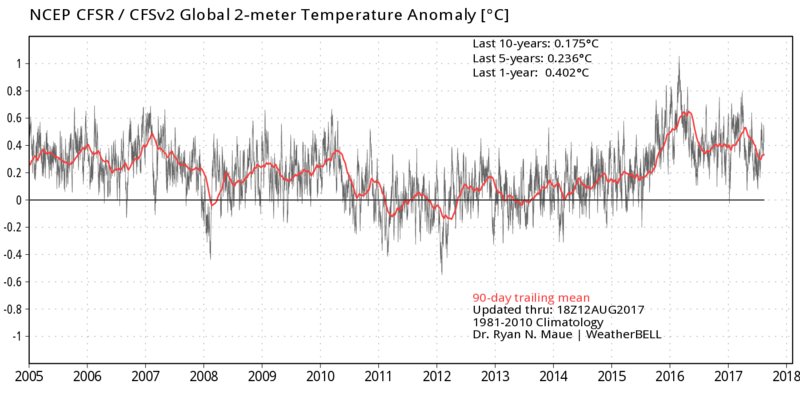 Global 2-meter Temperature Anomaly [°C]: Temperature anomaly as measured at 2-meters above surface level, often abbreviated "T2m". This page displays seasonal climate anomalies from the NCEP coupled forecast system model version 2 (CFSv2). Forecasts are from initial conditions of the last 30 days, with 4 runs from each day. Forecast ensembles consist of 40 members from initial a period of 10 days. The 1st ensemble (E1) is from the earliest 10 days, the 2nd ensemble (E2) from the second earliest 10 days, and 3rd ensemble (E3) from the latest 10 days. Aomalies are with respect to 1999-2010 hindcast climatology. Temporal correlations between hindcasts and observations are used as skill mask for spatial anomalies. Standard deviation to normalize anomalies is the average standard deviation of individual hindcast members. For SSTs, anomalies with respect to 1982-2010 climatology are available here. CAUTION: Seasonal climate anomalies shown here are not the official NCEP seasonal forecast outlooks. The NCEP seasonal forecast outlooks can be found at CPC website. Model based seasonal climate anomalies are one factor based on which NCEP seasonal forecast outlook is issued. This website provides data for "T2m", which literature papers seem to use as a shorthand for "temperature at 2-meters above surface level", as claimed in the plot. In this section, we present an analysis of the annual mean climatology. We will first compare spatial maps among reanalyses and observations for precipitation, SST and the related surface heat fluxes. Climatology of the full T2m field is not discussed in this section, as it strongly depends on the topography used for each reanalysis. In this section, we assess the variability of precipitation and T2m. We begin with a comparison of precipitation among R1, R2, and CFSR to see if changes in model physics during the past 15 years or so, together with the use of much higher resolution of the CFSR, lead to an improved representation of observed weather systems. We will then move on to a comparison of interannual variability of monthly anomalies among reanalyses and observations. So, that's where this partial answer leaves off at: interpreting the significance of the reinterpreted T2m data. 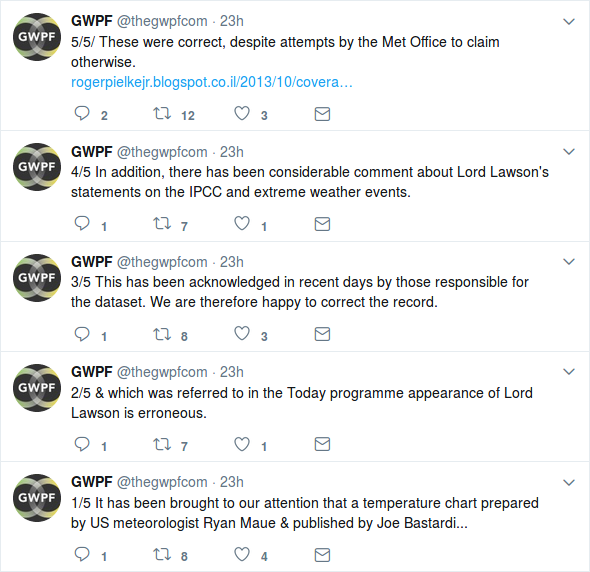 The claim made by the GWPF is directly contradicted by... the GWPF, the banner for their website shows the U.K. Met office's global temperature dataset, which shows that temperatures have obviously increased over the last decade. I've replotted the data below, using woodfortrees.org (They only have monthly rather than annual data, so I've used a 12 month moving average filter). No, and even if they are (which they are not), that wouldn't mean anything. Climate change is about what happens over the course of multiple decades, not just one cherry-picked date in the recent past. There are a number of issues with the above graph and the implication that 2007 was warmer than 2017. Even if the claim is true, so what? Climate change is about what happens over the course of multiple decades, not over the course of a year or even a single decade. 2006 to 2007 was a weak El Niño event. Except in El Niño years, it's almost always possible to cherry-pick the peak of some previous El Niño event (e.g., February of 2007) as the basis for the false claim that the Earth isn't warming. This has long been a standard ploy amongst climate change deniers. The graph used in the question uses the NCEP CFSR / CFSv2 reanalysis tools. Like the date, this represents a bit of cherry-picking. (I'll address that later.) A better source for global temperature anomalies is to use a dataset that targets estimating the global temperature anomaly. 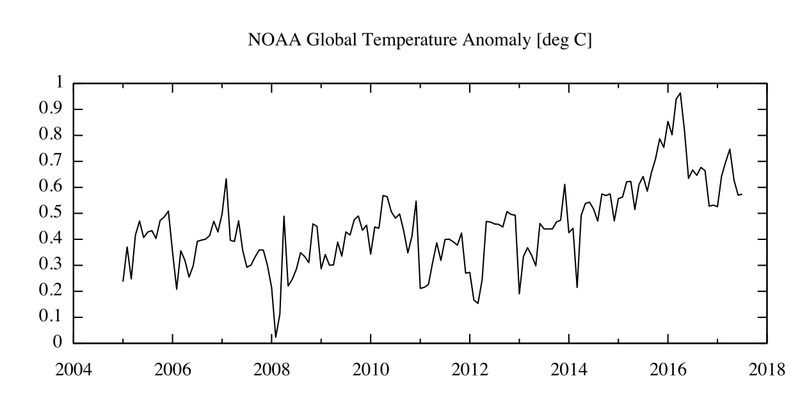 Below is a graph for the same time period as the plot in the question, but using the NOAA Global Temperature Anomaly dataset. The above ends at June because June 2017 is the last month for which data are available. Note that every month in 2017 has been warmer than the corresponding month in 2007. The claim is patently false. Using a reanalysis tool is a bit deceiving. A reanalysis tool takes in a variety of observations and adjusts the tool's underlying model parameters so as to best match the inputs in a least squares sense. That reanalysis tools have physics in their models makes them extremely useful tools for climate analyses, particularly what-if kind of analyses. However, the fitting and adjustments mean that a reanalysis tool will not reproduce the inputs exactly. As can be seen in the two graphs, the reanalysis tool does fairly good but not perfect job of reproducing the global temperature anomalies. The reanalysis tool slightly overstates the magnitude of the 2006-2007 El Niño event. 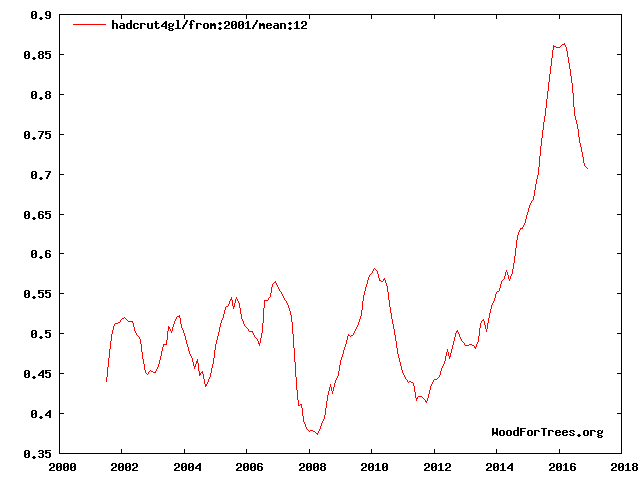 In fact, 2007 is only the tenth warmest year on record, tied with 2003 and 2006. January through April 2017 were each the second warmest months on record, with only the corresponding months in 2016 being warmer. May and June 2017 were the third warmest, beaten by 2016 and 2015. Given that the ENSO index is projected to remain positive but below the El Niño threshold, and given that July to December 2015 were extremely hot, this most likely puts 2017 on track to be the third warmest year on record, behind 2016 and 2015. No. See e.g. http://www.noaa.gov/news/international-report-confirms-2016-was-warmest-year-on-record-for-globe "The 27th annual State of the Climate report has confirmed that 2016 topped 2015 as the warmest year in 137 years of record keeping." What are the greatest successes of long term climate prediction? Do increasing global temperatures cause earthquakes? Are rising temperatures making fires worse? Have there been 28 years of “above average temperatures”? Is there more global sea ice than 35 years ago? Did global warming cause temperatures to drop because of polar vortex episodes? Could global warming lead to an oxygen shortage by 2100?